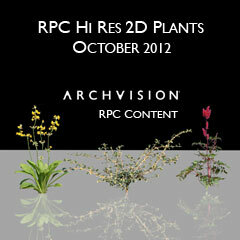 Introducing three new hi-res ArchVision RPC plant additions. This collection includes the yellow outdoor plant , red flowering shrub , and tiny yellow-budded flowering shrub . All of these are ready to download via the ArchVision Dashboard and begin using in your scene.